Lemon lovers, rejoice! The sunny, tart-meets-sweet flavor of everyone's favorite yellow citrus fruit shines brightly in our favorite lemon dessert recipes. You absolutely must use fresh lemons when making these recipes—bottled juice simply won't suffice! You'll be rewarded with powerful, puckery flavors and aromas that make your desserts sing. From classic lemon meringue pie to lemon cakes and cupcakes, cookies, custards, and more unusual desserts, we've got all the baking recipes you need to make the most of fresh lemon juice and zest. Lemon meringue pie is an all-American dessert that's been a family and diner favorite for decades. 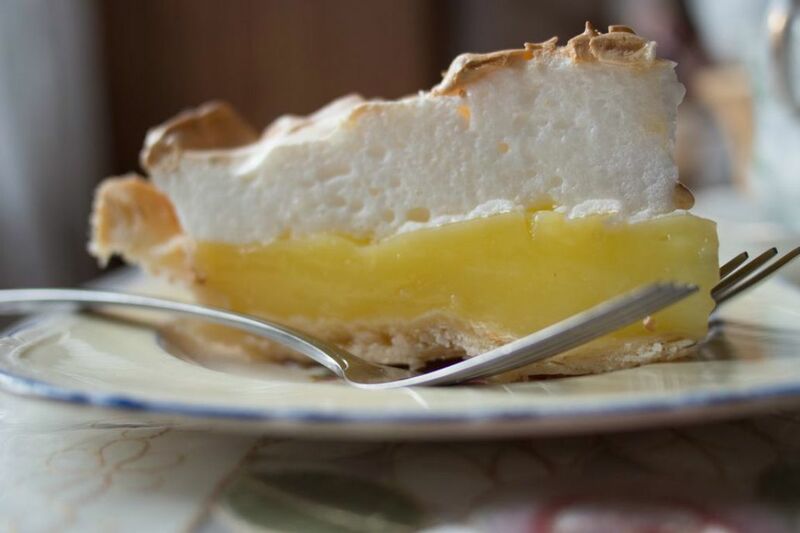 This is the classic recipe, with tangy, creamy, homemade lemon curd, and piles of fluffy, browned meringue on top. Spring is Meyer lemon season, and there's no better time to make this moist and and fluffy lemon cake. Sweet Meyer lemons have very thin skins, making it possible to use the whole fruit in the cake batter. This delivers an intense lemony flavor that makes this tea cake truly special. Sweet and pretty homemade lemon cupcakes with zingy lemon frosting make an adorable, delicious treat for baby showers and bridal showers, or any spring or summer occasion. Bake them in colorful paper muffin tin liners, and use a piping bag to apply the frosting for a straight-from-the-bakery look. Olive oil lends outstanding moisture to this extra flavorful lemon-infused bundt cake, and helps leftovers stay moist for days. Ginger and nutmeg add a hint of spice to this zesty batter, and vanilla soy milk adds extra richness. If you love the creme brulée served at fine dining restaurants, you're sure to flip for this zingy special occasion dessert of lemon custard with a caramelized sugar crust. Prepare ramekins of custard and store in the fridge up to two days ahead, then use a kitchen torch (or your oven's broiler) to create the crispy sugar topping just before serving. Wow your brunch or dinner guests with this lemon truffle pie that has to be tasted to be believed! Spoon prepared lemon curd over a mixture of melted white chocolate and cream cheese, bake in a single pastry crust, and savor the aroma. Serve topped with whipped cream and garnish with lemon zest or slices. Lemon pound cake makes a delightful afternoon treat for your book club or drop-in guests. This recipe is baked in a bundt pan, and finished with a lemony sugar glaze, for extra sweetness and zing. Send that lemon taste into overdrive by adding a teaspoon of salt to the cake batter. Enjoy these luscious lemon bars with a smooth intensely sweet-tart lemon any time. They make an especially great Mother's Day dessert. Finish the bars with lemon frosting for a beautiful look and even more tangy flavor. Simple, scrumptious lemon butter cookies topped with powdered sugar are perfect for dipping into your afternoon cup of tea, or sharing with friends at brunch and parties. Bake up a batch in just 30 minutes. Spike this sharp, tangy, lemon sorbet with plenty of fresh lemon juice, zest, and of course, vodka, to create a fantastic summer "adult" dessert for special occasion meals. Serve it in chilled martini glasses, as pictured, with a fresh mint garnish to complete the effect. Create a lovely, lemon curd-filled layer cake for parties with this essential dessert recipe. Lemon's sweet and tangy flavors are front and center in the frosting, made with cream cheese and more lemon curd. Impress friends and family with this gorgeous lemon raspberry cheesecake that tastes as great as it looks — and that's saying something! You'll love its creamy, tart-meets-sweet filling, nestled in a homemade graham cracker crust. Southern-style lemon chess pie makes a fabulous family dessert. Add plenty of fresh lemon juice and zest to the filling for tons of mouth-puckering flavor. Save yourself some prep time by using a store-bought unbaked pastry shell. Dried lavender flowers (available at health food stores, farmers markets, and online) add a subtle, elegant floral aroma to this bright-tasting lemon pound cake with lemon-lavender glaze. Serve it for special spring occasions and events, using additional buds to decorate the cake plate. 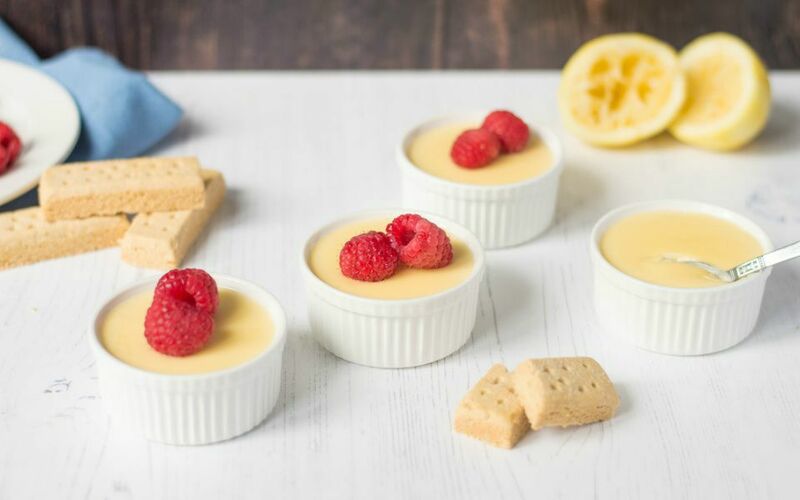 Make these super-easy individual stovetop lemon custards any time you're expecting dinner guests and prepping dessert in advance. It only takes three ingredients and 15 minutes to make. Chill the mixture in ramekins in the fridge while you go about your day. Lemon bark makes a fabulous homemade food gift, if you don't eat it all yourself first! Top layers of bittersweet dark and lemon-infused white chocolate with candied lemon peel to create this gorgeous, sharable candy. Kids and adults alike will inhale this fluffy lemon cheesecake mousse that's light enough to enjoy on warmer days. Add your favorite berries for garnish, and feel free to make it with key lime in place of lemon for a fun variation. Serve up a patisserie favorite with this simple, classic French lemon tart recipe. The tangy lemon filling is made with creme fraiche (or sour cream) for extra richness, creating a beautiful balance for the sweet, flaky pastry crust. Homemade lemon marshmallows are tangy as all get-out, light as a feather, and kick store-bought marshmallows to the curb! Dip them into melted dark chocolate and let them set for a treat grown-ups will rave about, or dust them with powdered sugar for kids to enjoy. Vegan lemon cupcakes are wonderful to enjoy in spring and summer, and make a great lunchbox treat. Olive oil and soy milk in the batter keeps these cupcakes extra-moist. Store the finished cupcakes in the fridge, or freeze up to three months. You've heard of a cheese souffle, but have you ever tried a classic lemon dessert souffle? Making one is easier than you may think, using our step-by-step recipe. Sprinkled with powdered sugar, it makes a light yet satisfying dessert for dinner parties or a romantic dinner at home. Cham cham is a traditional North Indian dessert that comes in a variety of flavors. This treat requires a number of steps to make, but produces sweet, pillowy dough balls you'll dream about for weeks. If you're up for something different, try making a version that's flavored with freshly squeezed lemon juice and aromatic saffron. Whether you enjoy it for dessert or as a palate cleanser between courses, this ultra-smooth lemon sorbet is sure to please your taste buds. Use your ice cream maker to prepare it, and enjoy whenever you crave a simple cooling scoop of lemony goodness. Create a quick and easy chilled lemon dessert to enjoy on warm evenings. Instant lemon pudding offers a helping hand as filling, spread over a super-simple crust, and topped with sweetened cream cheese and whipped topping. Lemon dessert sauce is delicious drizzled over fresh fruit, gingerbread, cakes of all kinds, and Sunday morning blueberry pancakes. This sauce boasts a thick, custard-like texture thanks to heavy cream and egg, and a wonderful sweet-tart flavor from fresh lemon juice.